"A lovely sample library ... You are not going to find these sounds anywhere else. I auditioned the samples one by one and I got incredibly itchy to start messing with them right away - they are so inspirational and musical." 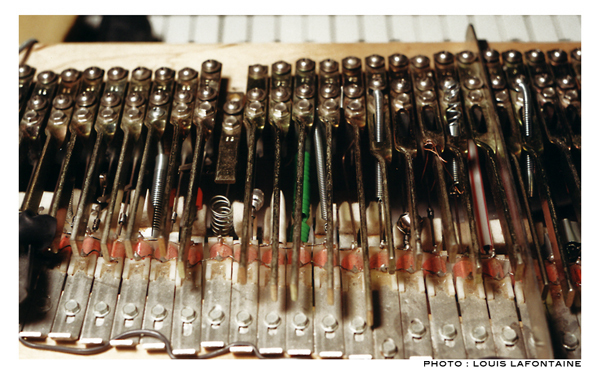 "Each note has a different mechanical preparation and was recorded for its full duration at several Velocities. These make exceptional semituned percussion instruments. For more conventional playing, presets are provided that map a single sound across the keyboard." There are 2 main programs that emulate the actual instrument where each key has a different sound. The first one covers 72 keys, the second one 52 keys. Each key has a unique sound with up to 6 velocity layers. The sample set size is 63,2 MB containing 360 samples (32 MB download). Note that the size is doubled for the Wusikstation and EVE formats as they both use a proprietary 32 bits sample format. Also included are patches simply made from one sound mapped across the keyboard and you can create your own. These make fun semituned percussion instruments. Their number vary according to each specific format. Moreover, as each platform has unique features, you will find additional patches using these features. Details below for each specific format. New, Mobile version is available for $1.99. IT IS NOT INCLUDED with the purchases made on this page. Click HERE for more info. As there are different versions of the PR, I have indicated with which format(s) these MP3s can be made (also in the ID3 tag). Except where noted there's only the PR used in the MP3s and the name of the patch is indicated by the title or in the ID3 tag when applicable. Note that the 2 pakages below do not include the Mobile version that is on the Sounds for iPad and iPhone page, nor the Caustic 2 version. Wav files and Soundfont : wav files and soundfont can be used with any sampler or software that supports them. The soundfont includes 43 programs (38 semituned instruments). Native Instruments Battery 3 and Kontakt 3 with the wav files and soundfont: both have over 115 kits/patches including 67 semituned instruments and 47 (55 for K3) extra patches where the samples are twisted and warped with their granular synthesis engine. With it the samples take a whole new dimension and the results vary from clean sounds evocative of traditional instruments to weird SFX. Note that it does not include the Mobile version.